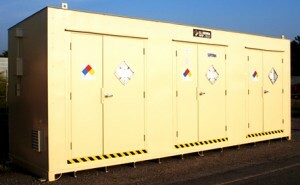 Considering buying a hazardous material storage building? Know what to look for, and who to trust. At U.S. Chemical Storage, we’ll work with you to design a hazardous material storage building to suit your needs. If you’re looking to store your hazardous material, you need a building that’s specifically designed to maintain your substances. This means certain things like climate control and ventilation to prevent chemical decomposition and fire hazards, as well as segregation to help you avoid dangerous chemical reactions. Your hazardous material storage building should do all these things, and more. The first step to designing your hazardous material storage building is understanding the hazards and characteristics of the substance you wish to store. Knowing if it is flammable, explosive, or corrosive can help you determine what sort of environment it should be stored in. Reactivity reports will reveal incompatibilities, telling you what your hazardous material can and cannot be stored with. Your hazardous material storage building should be designed accordingly. Take the time to understand your substance’s characteristics when purchasing a hazardous material storage building. Things like melting points, flash points, and boiling points can help you determine what sort of environment your hazardous materials require, and hazard reports can tell you whether you should choose explosion- or fire-proof construction. A hazardous material storage building from U.S. Chemical Storage can be fully customized to meet all safety regulations, and then some. Whether your hazardous material is flammable or non-flammable, we can construct you a hazardous material storage building that is safe and compliant. Our accessories are designed for additional protection, including fire suppression systems, climate control, and mechanical ventilation. Whether you plan to store large quantities or small amounts, your building will be constructed to your specifications, with a leak-proof containment sump to hold any leaks or spills and prevent your hazardous materials from entering water systems. When it comes to your hazardous material storage building, trust us for ultimate safety and compliance.